Our product range includes a wide range of health sole and upapa back massager with thigh calves and feet massage. 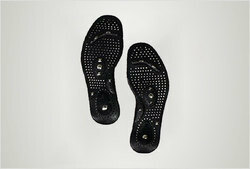 16 magnets are strategically placed to stimulate the vital reflex points on your feet, further enhancing the reflexology effects of the soles.Made from durable synthetic resin and permanent ferrous magnets. Power of Taiko-strength Drum-Massage Taiko is traditional Japanse percussion instrument characterized by a deep reverberant sound and rumbling power. OSIM uPapa brings you the intensity of Taiko and packs in a powerful punch. The power drumming from its symmetrical 6-point drum-massage provides deep tissue relief, loosening your muscle layers to improve blood circulation and making you feel more energized after each massage. uPapa – Power of Taiko-strength Drum Massage – Unlike conventional massagers, OSIM uPapa’s power drum-massage pounds away muscle aches and strain to perk you up. Pressure Sensitive – uPapa’s unique pressure-sensitive mechanism reacts to your ‘body language’. The harder you lean on the uPapa, the stronger the tapping and vice versa. The versatile uPapa is designed to cater to your varying massaging needs, from gentle massage to a more intense therapy. Choose and combine your desired massage from a suite of 7 Rhythmic Massages, 7 Drumming Positions and 5 Massage Intensities to enjoy a more personalize therapy. 7 Rhythmic Massages – Select the rhythm (speed) of your massage, from gentle tapping to quick thunderous drumming. 7 Drumming Positions – Select different drum-massagers to target an exact spot or a wider massage area. 5 Massage Intensities – Control the strength of your massage according to your needs and preferences. OSIM uPapa brings innovation to you. Designed with efficacy and comfort in mind, it has the features that make massaging convenient for you. l OSIM uPapa is fitted with an inclined stand to let you adjust the massage angle for best results. l Removable and washable fabric cover keeps the dirt and dust away. Automatic Massage Program– Sit back, relax and enjoy uPapa’s Automatic Massage Program. With the touch of a button, uPapa automatically integrates the various rhythmic massages, drumming positions and massage intensities to give you a well-balanced massage that re-energies your tired body. OSIM uPapa brings relief to your tense muscles from your back to your feet. Place uPapa behind your back, under your thighs, calves and feet to enjoy an invigorating massage. Choose Automatic Massage Program or Customize your massage according to your preference at any of these positions. With a sleek remote controller in your hands, you can select your massage options easily and conveniently. When not in use, the remote controller can be stored neatly in a specially designed compartment. 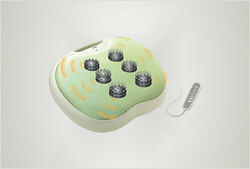 Looking for Acupressure Massager ?